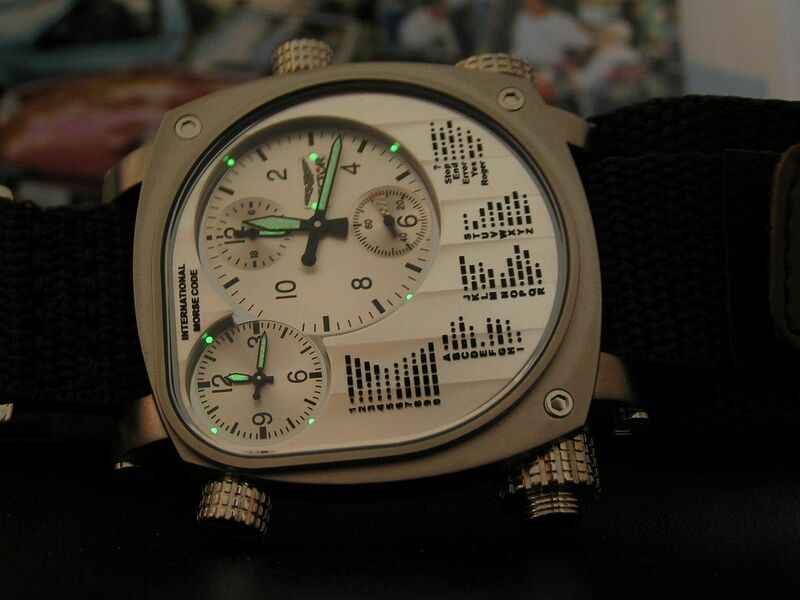 This Sector Compass Series watch represents what could be one of the most outlandish watches purchases I have ever made. Clown sized? Yes. Just plain goofy? Perhaps. Cool in a geeky way? Of course! Does it have any useful purpose? Maybe. Will gadget geeks like it? Definitely! 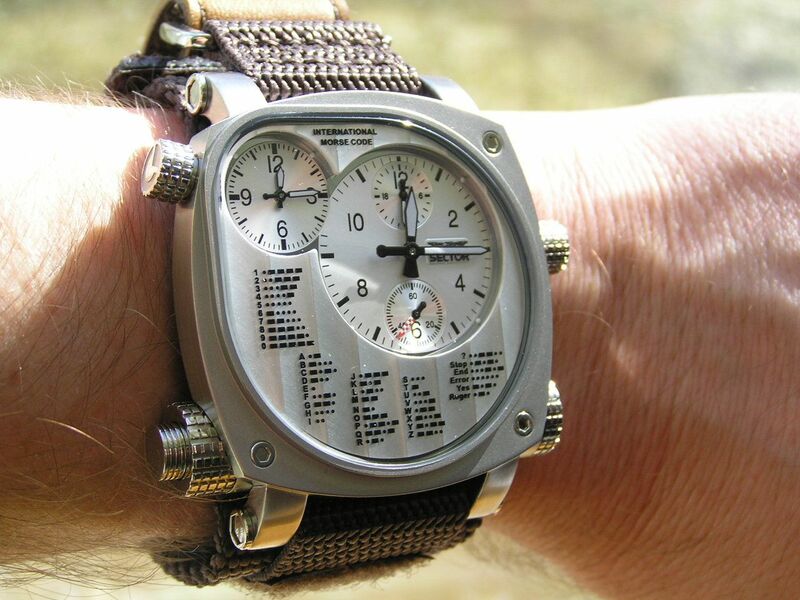 I’ve always liked watches that are unique, multi-purpose or just cool in some sort of way. This Sector fills the bill on many levels. 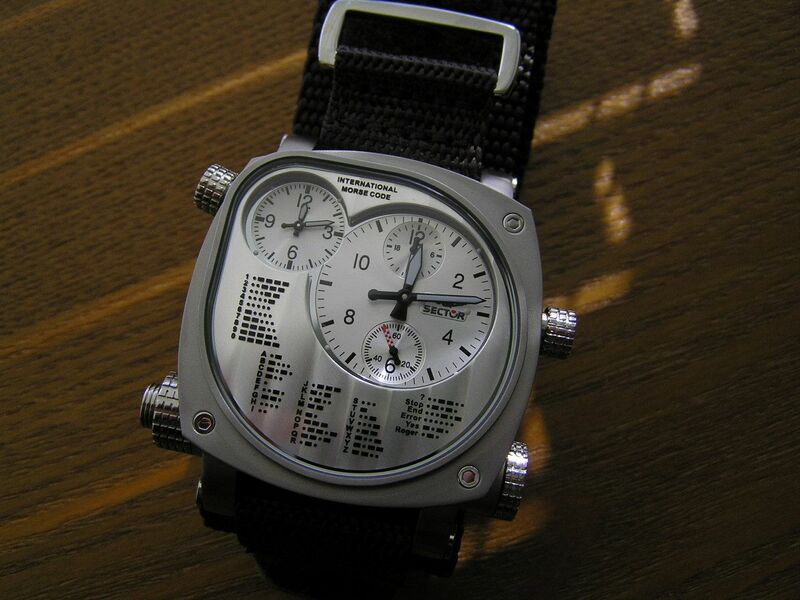 Being a licensed ham radio operator, I was naturally drawn to the morse code aspect of this watch, which is of course, really more of a gimmick than anything, but unique nonetheless. I have to give Sector credit for having the guts to produce a watch such as this that would have a presumably limited appeal. 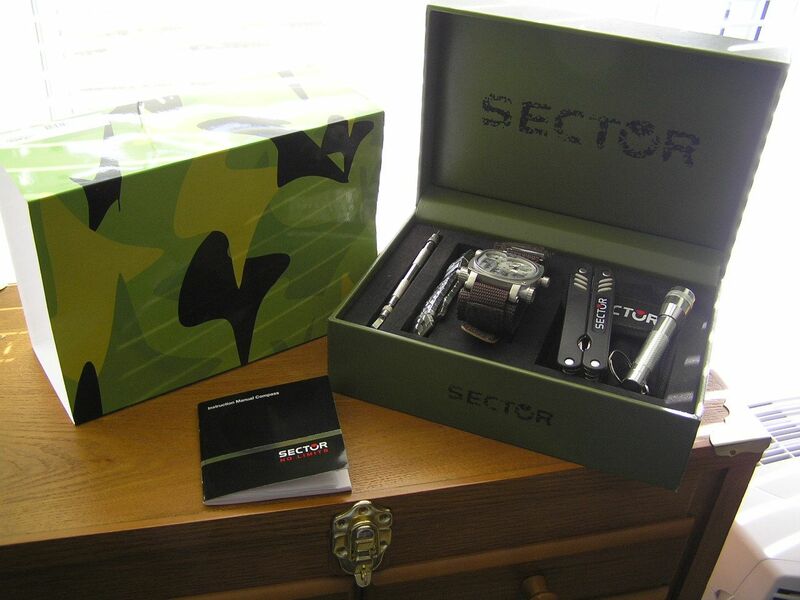 For starters, one thing that piqued my interest with this Sector Compass Series was the fully outfitted ‘kit’ that was included with the watch. Arriving in a huge olive green padded box inside a cardboard outerwrap festooned in camo printing, you know you’re holding something special. 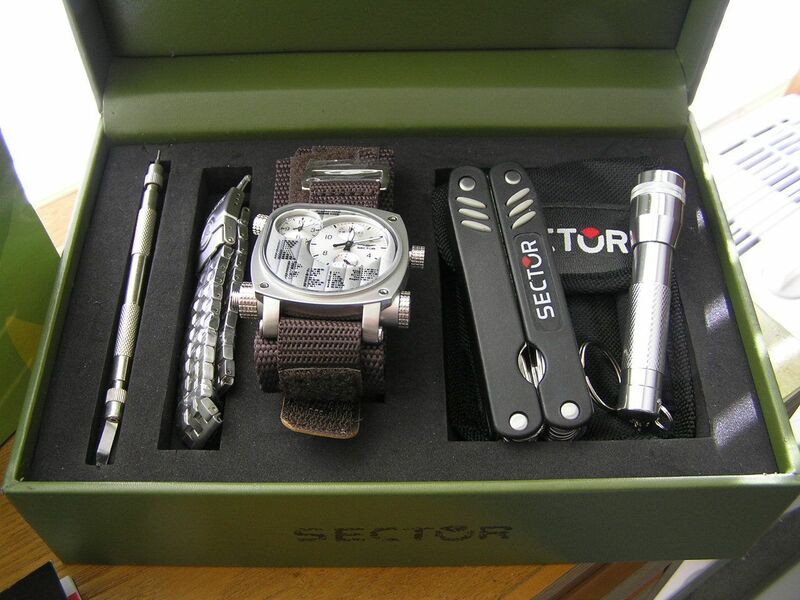 Inside the box was the watch, a dark brown nylon and tan leather ‘fast wrap’ NATO strap with Velcro closure, a nice quality strap changing tool and a Sector signed heavy nylon pouch which contained a mini mag-style keychain flashlight, AAA battery and a Sector logo folding 12-piece multi-tool, with long nose pliers, knife, stubby blade scraper, flat blade screwdriver, a second flat blade driver, bottle opener, fish descaler, file, ruler, Phillips head screwdriver, mini scraper and can opener. A very nice, practical and fun presentation. The watch itself starts with an all stainless steel case measuring a whopping 47.6mm without any of the crowns or pushbuttons. The case is best described as a squarish style with rounded edges (there’s probably a geometric designation for it, but math was never my strong point). The case itself sports faux hex heads in the corners and a brushed finish. 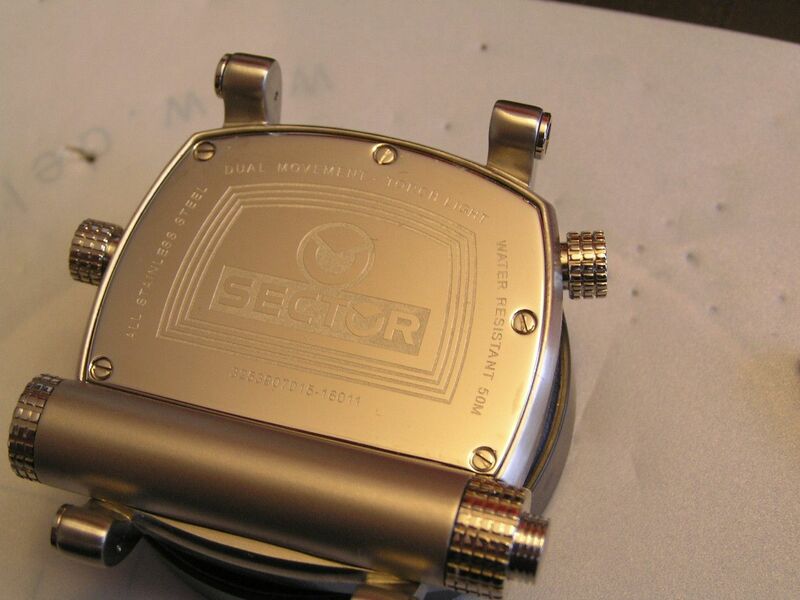 The caseback is polished and is irregular in shape, due to the torch light taking up space at the bottom of the case. 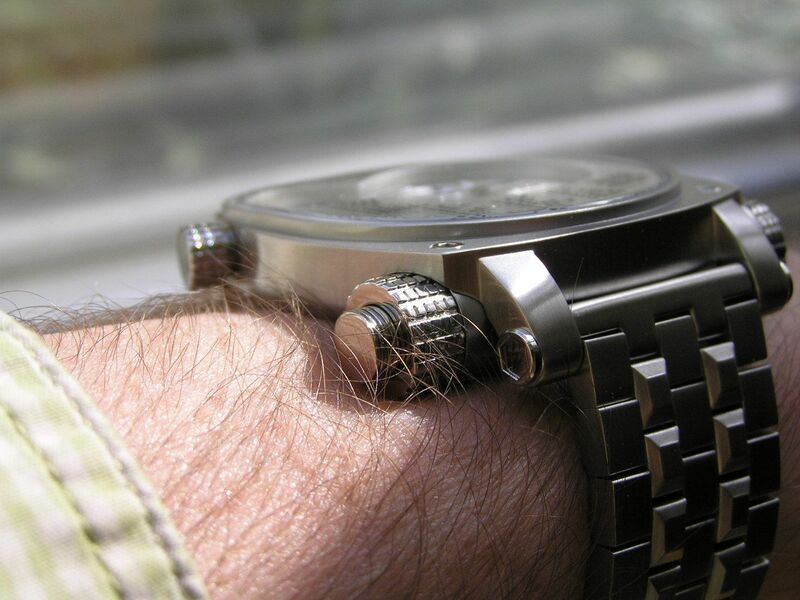 The caseback is secured by five screws. 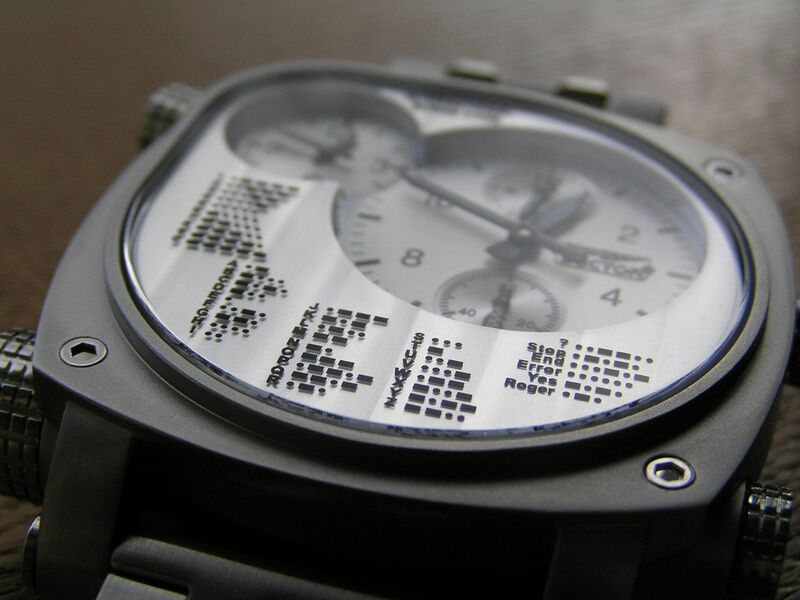 Factory water resistance is a meager 50 meters, kind of puny for a watch that purports to be ready for any adventure. The crystal is flat mineral and is the largest crystal of any watch I own. The crystal is a kind of lopsided circle/square in shape, but it covers a lot of ground on the watch face. The smaller dial on the upper left is the second time zone, with simple luminous hour and minute hands. 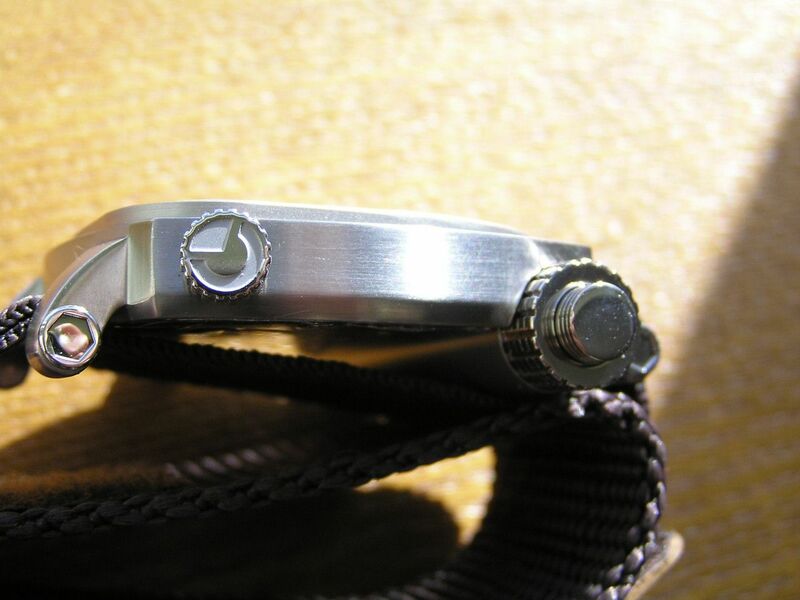 The signed screwdown crown protruding out at an angle on the upper left of the case sets this movement. 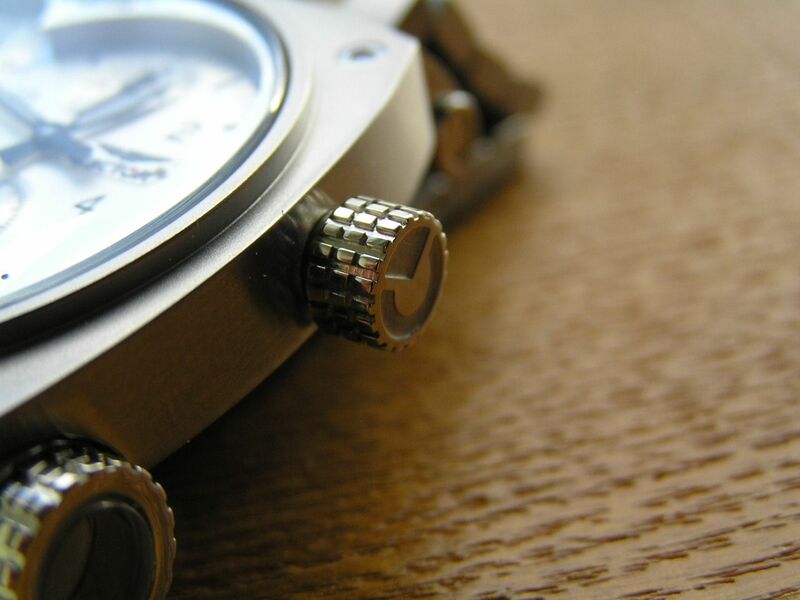 The main watch face is in the upper right of the dial and is about twice as large as the smaller watch face. 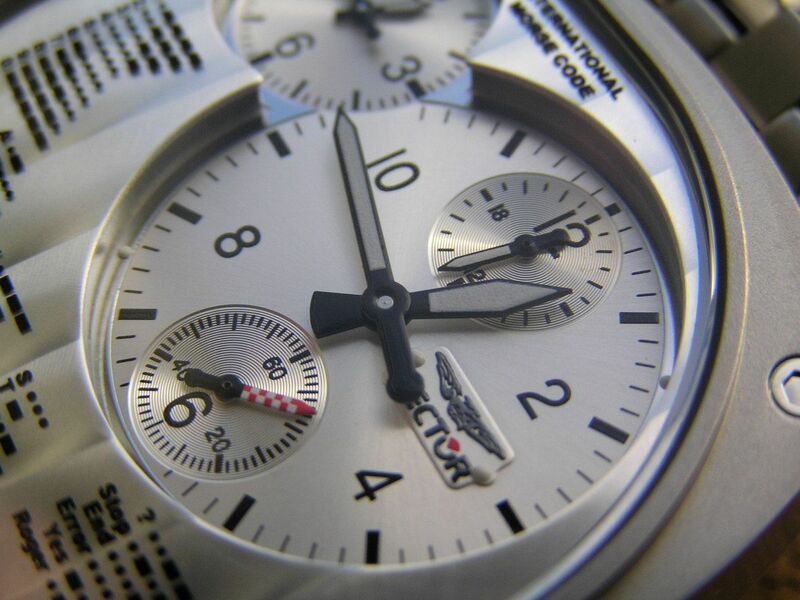 The main dial sports a 24-hour indicator subdial at 12 o’clock, and the watch subseconds at 6 o’clock. The hour and minute hands are luminous on this dial, as are the tips of the hands on the subdials. 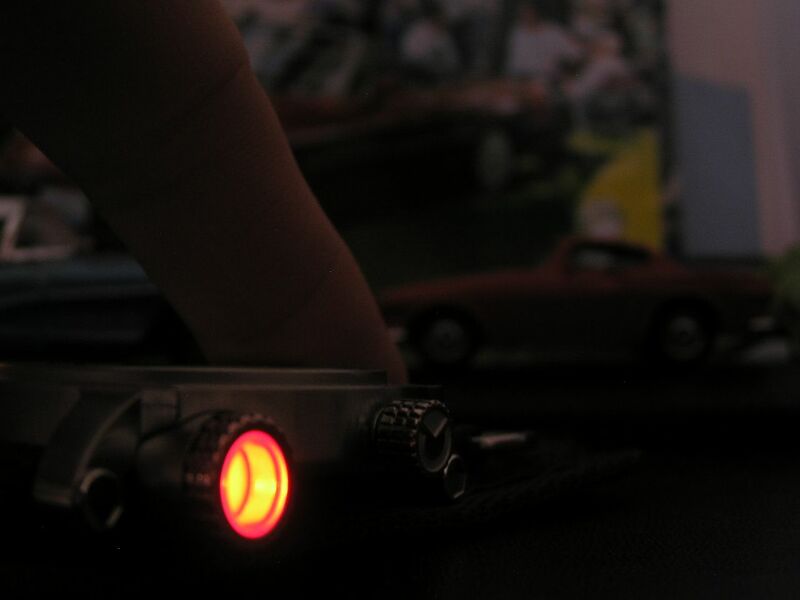 The second hand is a red checkerboard with alternating luminous squares which look cool when seen in the dark. 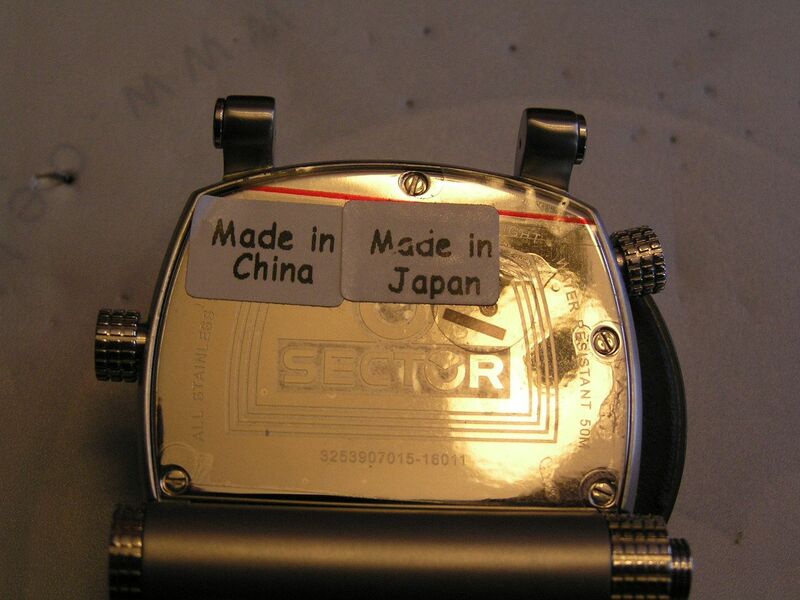 The crown on the right side of the case (screwdown and signed) sets this movement. 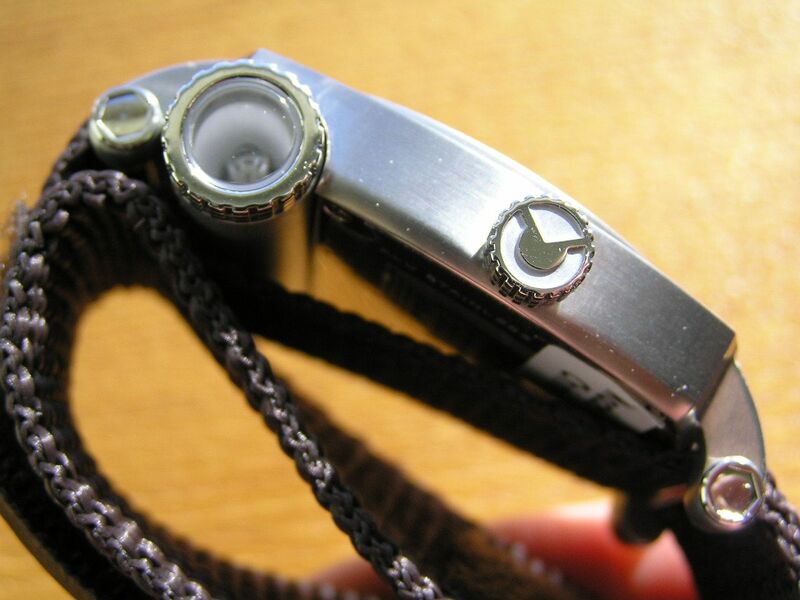 There are also three or four luminous dots around each watch face and two on the edges of the Sector logo. 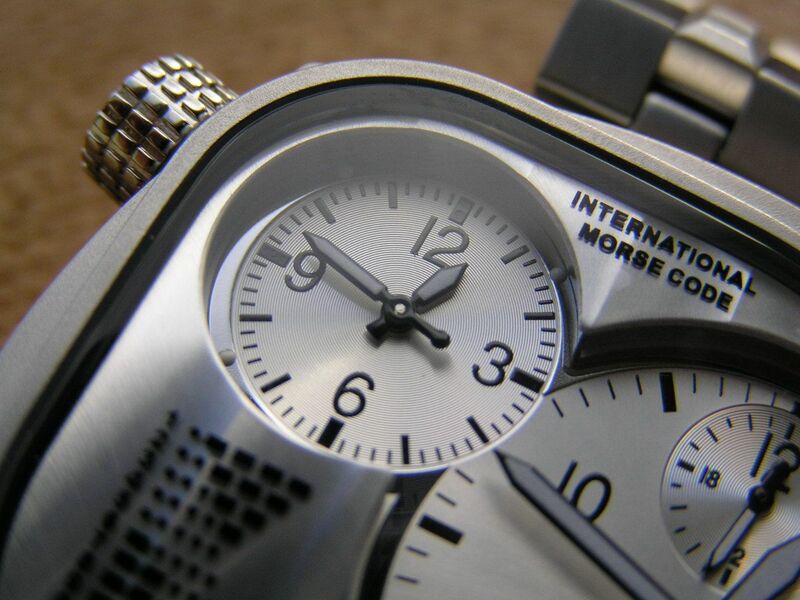 The watch dials are also inset into the case, which gives them an interesting look, as does the Geneva stripe-like styling on the morse code portion of the dial. Each watch dial has a combination of black markers and/or black Arabics and the hour and minute hands are black with lume infill. 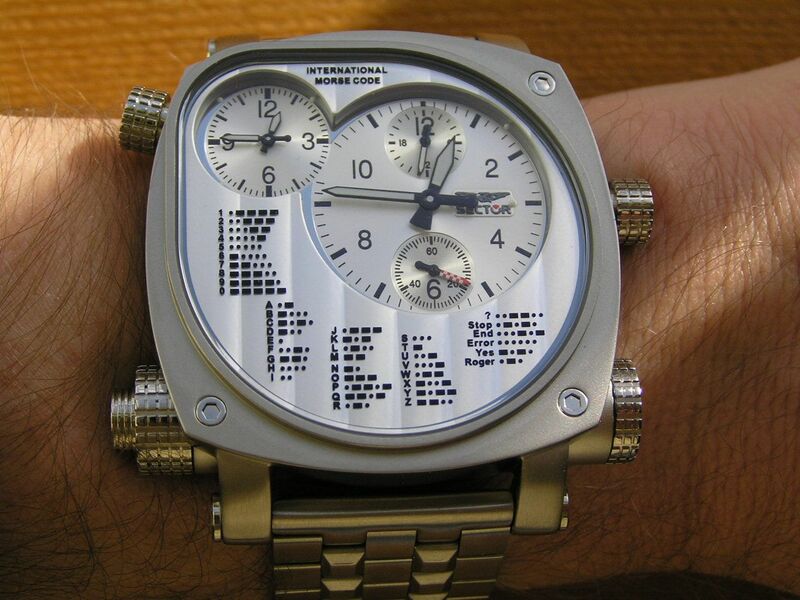 The rest of the watch face is taken up by the listing of the international morse code, which lists the complete alphabet A to Z, plus numbers 0 to 9 and a few extra international commands, such as 'roger' or 'end.' One curious flaw is the incorrect listing of the letter ‘P’. It should be one dot, two dashes and one dot, but for some reason, Sector misprinted and added an additional dash at the end. Hmmm. Wonder what happened there? 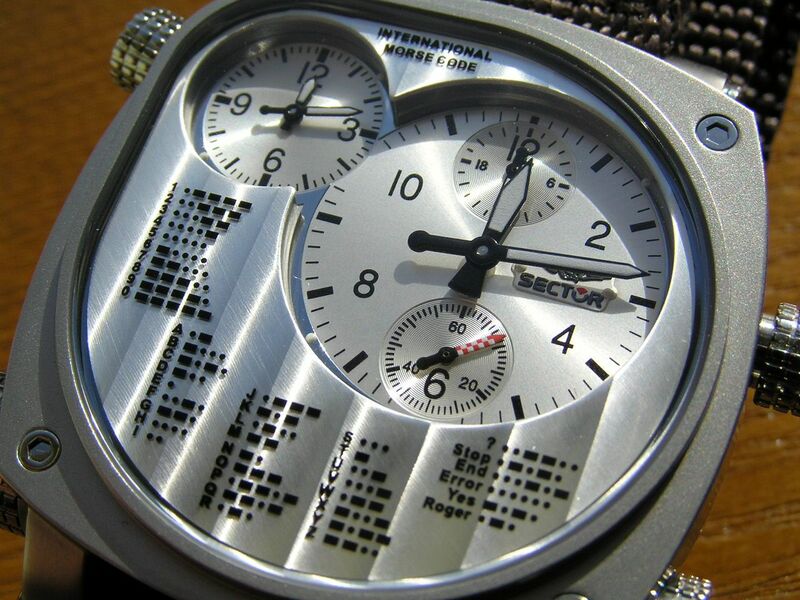 The bottom of the watch case is rounded at the caseback and contains the red-lensed ‘torch light’ for sending morse code messages, via the large pushbutton on the lower left of the case. The torch light is powered by four (!) 377 batteries. Simply depress the pushbutton to illuminate the light and start sending your morse code message. Geeky but cool. The torch light isn’t too bright and I have no idea how far it would carry in a pitch black forest. It would be cool if they supplied different color filters to change the color, but alas, I’m stuck with red. The case is a surprisingly thin 9.6mm thick with beefy 24mm lugs. The sides of the lugs sport faux hex head screws as well. The bracelet is a 24mm continuous-width stainless steel brushed solid link affair with straight ends and a multiple five-link design. 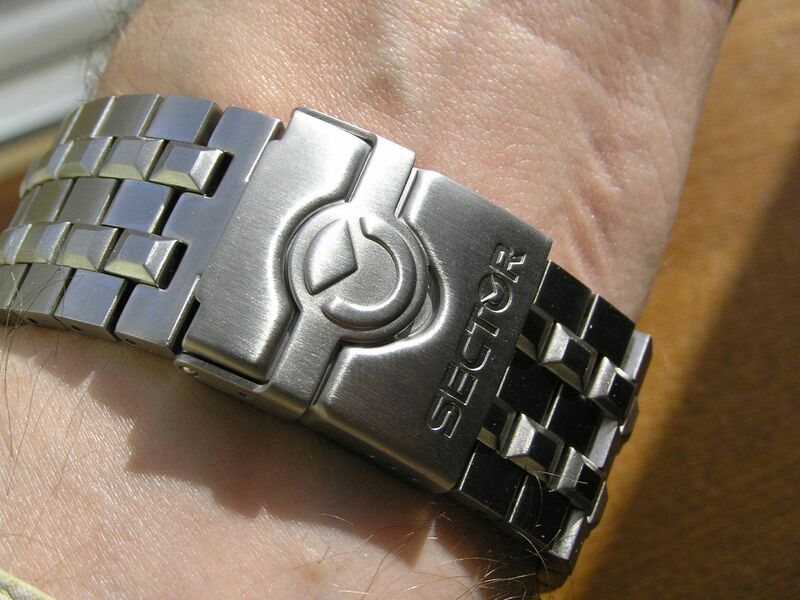 The clasp is a double locking design and is signed with the Sector logo. Unfortunately, it has a cheap stamped deployant, but this watch is one of Sector’s pieces that are made off-shore in China, not Switzerland, so they had to cheap out on it somewhere. 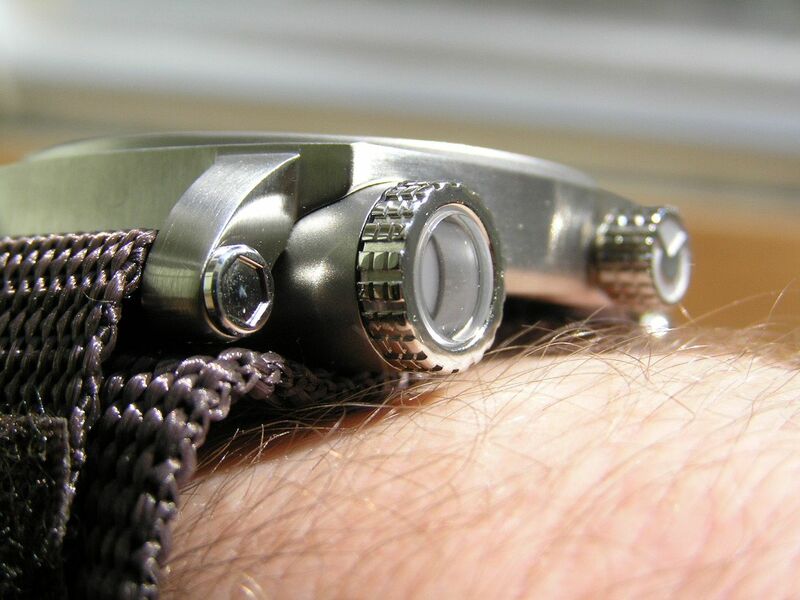 Nevertheless, the bracelet is fairly close in quality to a Watchadoo or similar type bracelet. 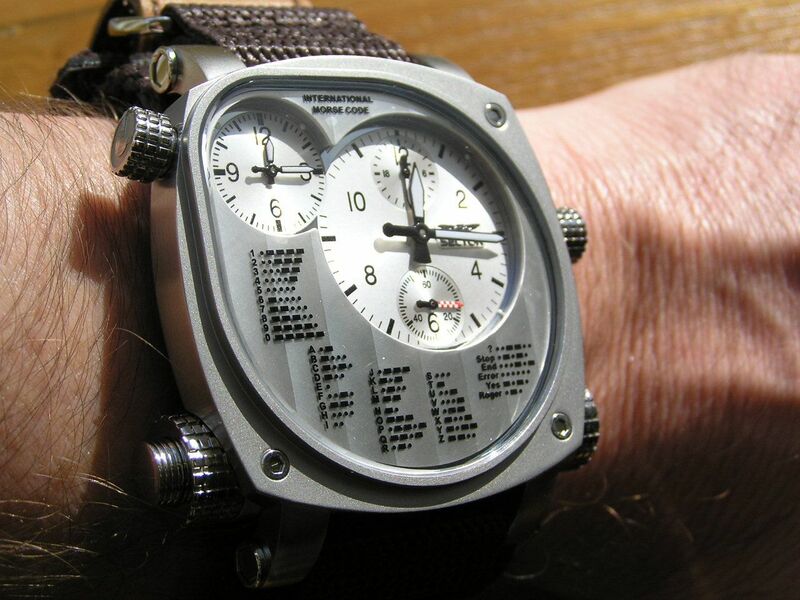 For a watch this size, it is not a very heavy piece, which is probably good, since you wouldn’t want nearly 48mm of stainless steel flopping around on your wrist if it weighed two pounds. 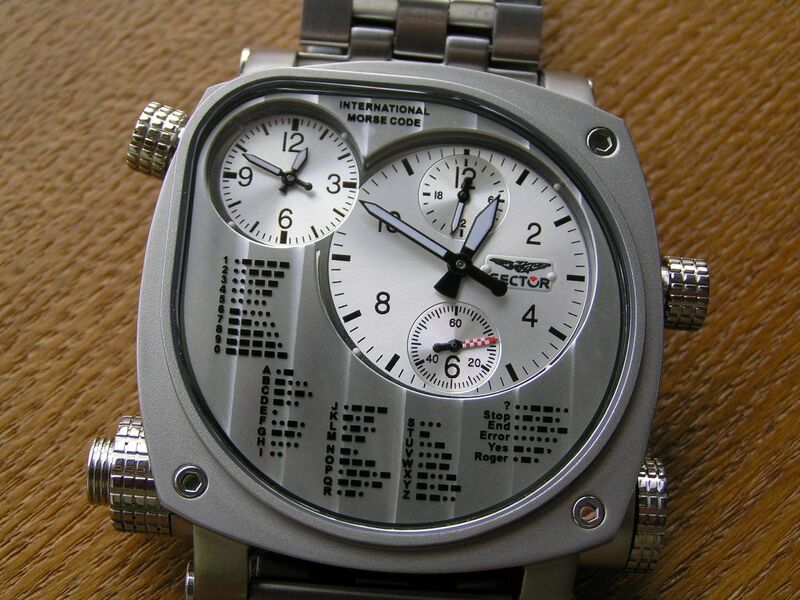 Timekeeping has been fine and I believe the twin quartz movements inside the watch are Japanese, as the caseback sported identity-crisis inducing ‘Made in Japan’ and ‘Made in China’ stickers, so I believe the movements are Japanese and the watch is cased in China. I found this to be humorous (see photo). I do find both dials to be easily readable and quite attractive to look at. The lack of a day or date display doesn’t bother me and I guess Sector thought if you get lost in the wild, it doesn't matter if you don’t know what the day or date is as long as you can send a morse code rescue message. 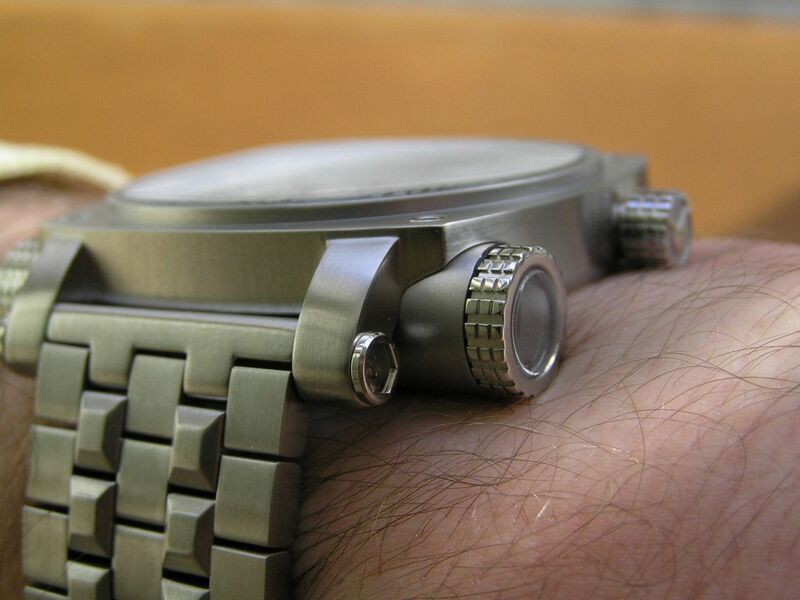 The watch is not exactly the most comfortable on the wrist when worn with the bracelet, as the large pushbutton and torch light lens cover tend to dig into the wrist. 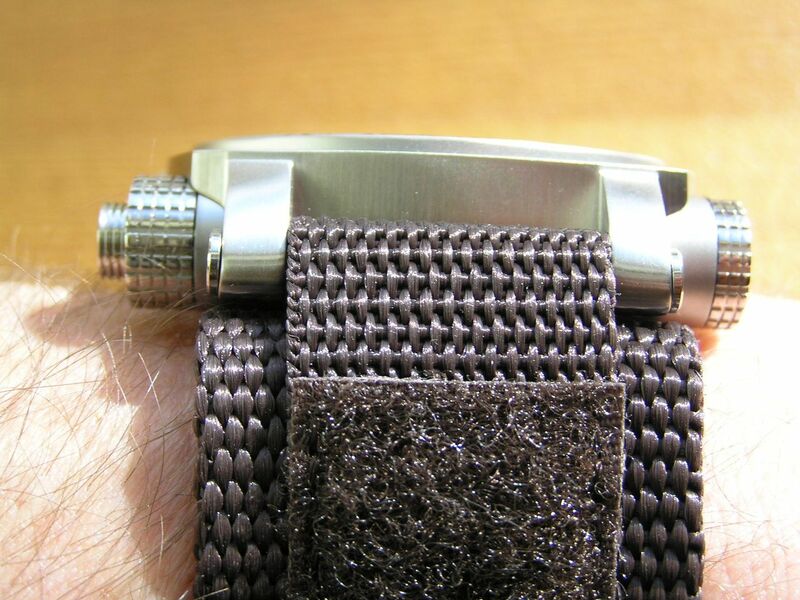 It would be more comfortable on the NATO strap, but the heft of that strap makes the overall watch that much more bulky. Overall, the build quality of this watch is pretty decent. As an example, the pushbutton for the torch light unscrews to allow access for battery replacement and the pushbutton is gasketed to prevent water or dirt intrusion. The crowns both screw down and are signed and the screwed-down caseback bespeaks of quality. Yes, this watch is goofy. But, WISing sometimes verges towards the impractical or unnecessary, which is the category I feel this piece falls into. 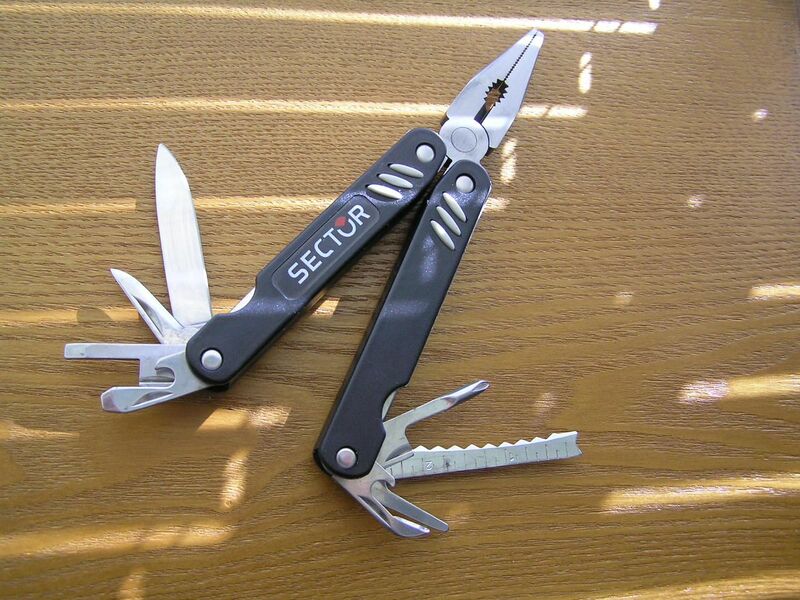 But what gadget freak amongst us could resist this piece, with its totally cool tool kit and outrageous looks? You decide. Cons: big, outrageous, impractical, gimmicky torch light, needs better water resistance to match rugged image, who really uses morse code anymore? I sold this watch shortly after acquisition. I purchased it mainly out of curiosity and wanted to see what it was really like. A unique piece for sure, but not really for me in the long run. is just wrong! As the correct one is this, instead: .--. I have purchased one of these watches for a price of 150.00 brand new in the box. I was curious about the watch as it has a cool look and liked the torch light used for morse code (even though I most likely will never use it). Although the torch light doesn't get very bright if it was to be used as designed it would be hard to see the light unless it was dark and the person/people it was aimed at weren't further that 20 feet away. 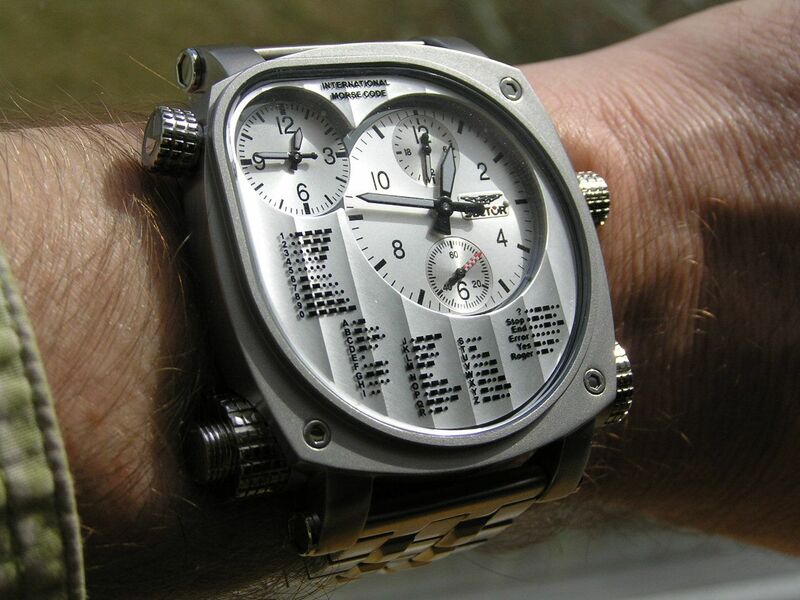 Nevertheless it is a cool looking unique watch that tells time rather well, which is really the only thing I use it for and maybe all it is good for. It's heavy and rather large but I kind of like that, although lighter with the nylon band. If you can find one for under 150 bucks and like the look of it, buy it you will like its uniqueness. If your buying it for any other reason then just to tell time then it may not be for you. One more thing, the tools and flashlight that come in the box aren't of high quality, they are nice to look at but will most likely fail under hard use. The flashlight definitely is NOT Maglite quality.